In order to ensure that the Durban International Convention Centre (Durban ICC) maintains its status as a world-class facility, the company has invested significantly in a number of key projects to enhance each guest’s experience and provide a safe and secure venue for visitors. The Durban ICC is one of the most flexible and versatile venues in the world. The Centre’s main convention area of 11,600m² can be opened up to form one enormous venue or subdivided using operable walls into 22 separate convention halls of various sizes. Hall 1, also affectionately known as the Hall of Stars, because of its intelligent lighting system, offers event organisers the choice of either a magnificent auditorium seating 1,680 delegates or, with the raked tribune seating raised into the ceiling, a traditional flat-floor convention hall of 1,448m². The Hall 1 Tribune seating has served the Durban ICC for 21 years and its unique design adds to the flexibility and versatility of the Centre. This tribune system allows for the entire seating structure to be raised into the ceiling, revealing the intelligent fiber-optic lighting on the underside. This feature offers the client with the choice of either an auditorium setup or column-free, flat-floor event space beneath it. This kind of multi-purpose functionality is a feature that no other local convention centre can boast of. In order for the Durban ICC to maintain the world-class standard it holds, equipment and structures are regularly inspected and upgraded. In January 2019, the Durban ICC embarked on a R6-million project to have the Hall 1 Tribune seating refurbished. All components for the Hall 1 Tribune seating are manufactured locally. 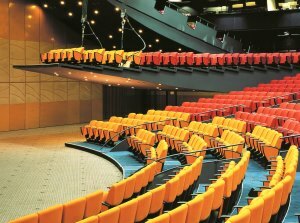 The wave auditorium chair is the only locally manufactured auditorium chair that is SABS tested for Acoustic and Structural use in an auditorium environment. Durban ICC Chief Executive Officer Lindiwe Rakharebe said the project has given Hall 1 a fresh, relaxed and comfortable feel. Rakharebe said this was in keeping with the Durban ICC’s vision to create inspiring convention, exhibition and entertainment experiences that exceed our customers’ expectations; in an innovative and sustainable way. “As a venue that takes pride in the fact that we are a world-class convention, exhibition and entertainment centre, our primary goal is to enhance our guests’ experience and the refurbished Tribune seating will definitely improve guests’ relaxation and comfort,” said Rakharebe. In total, the Durban ICC plans to invest R27.3 million in various Capex projects over the next year.